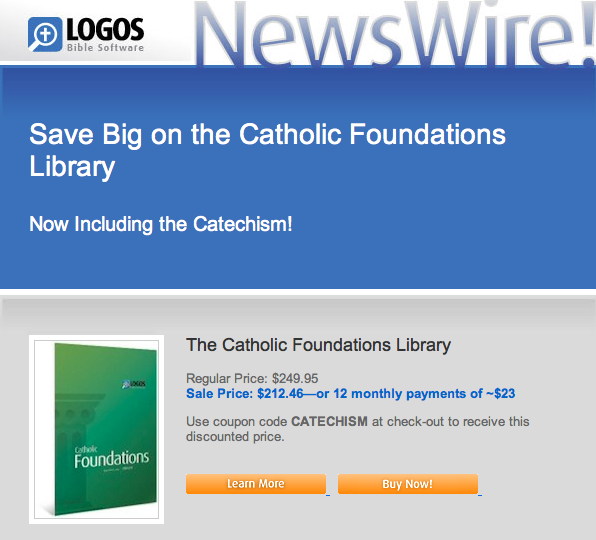 Catholic & Bible Study: More Resources, Lower Price – NOW with the Catechism! Me, Jimmy Akin, Patrick Madrid, Mike Aquilina, Dr. Michael Barber and many other Catholic teachers — we all use and love Logos and highly recommend it! Want to take your Scripture study to the next level? The Catholic Foundations Library brings the Holy Scriptures and tradition together like never before by including the resources you need to delve deep into the Bible, from the writings of St. Augustine to the Catechism of the Catholic Church. With just a few clicks, move from the readings of the day to reference works, commentaries, and theological volumes. These powerful resources make the Catholic Foundations Library a solid platform for your study. The Catholic Foundations Library is the perfect way to start building your digital library, with over 150 of the most important Catholic resources worth more than $3,000.00 in print! • The Catechism of the Catholic Church, 2nd ed.